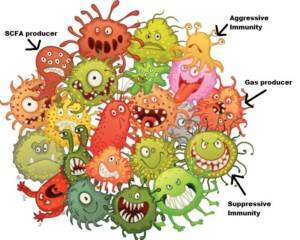 There are some gut flora that resides in your intestines on a daily basis. There are good flora and bad flora; all depending on what you have ingested and whether or not your stomach has an allergy to it or you have ingested possibly a toxin such as a food poisoning. It seems everywhere we turn today that we hear about all the harmful items that have been added to our food. From the pesticides used on crops for various reasons to hormones used to make animals grow more quickly, and antibiotics used in the animal food to keep it from going bad. It feels we are ingesting toxins no matter what we ingest. You would think that with all of this mixed in our fast food, the prepackaged food, and the “fresh food” you have bought at the grocery store that your colon would be a “toxic waste dump site.” If you don’t think so, I am sure at times it must feel like one when you become constipated. I say this because I can speak for myself. The two best ways or strategies to help detoxify your own body is getting lots of exercise and eating a well-balanced diet. Below we will talk about natural colon cleansing which is a practice that dates all the way back to the ancient Greeks. It didn’t gain popular use in the United States until the early 1900s. In the U.S. it eventually went away as people felt like the theories behind it were just that, only theories. But, lately, colon cleansing – is back in the spotlight and some people are using enzymes, teas, or performing colon irrigation. There seem to be instances where our “gut” needs some help to get rid of those toxins who like living in our colon. The following are five ways to cleanse your colon. Using an oxygen-based colon cleanser could be helpful to get your colon on the path to start detoxifying as the cleanser begins to release oxygen. Oxygen seems to be beneficial and essential in removing toxins from our colon, almost as much as staying hydrated. No matter what you eat if it has toxins on it; it will at some time or other make it to your colon. If you don’t clean your colon (which in turn will keep your liver clean), those toxins can stay inside your colon and wreak havoc. By getting rid of the body wastes that won’t leave supports the primary functions of your colon that includes making the flora in the gut that we must have to digest our food properly. Low-fiber foods are almost always unhealthy to eat as part of your diet. If you do not have enough fiber, digestion slows down and getting your body to feel “full.” seems never to happen. Those foods low in fiber also seem to take the 35 miles per hour bus instead of the 55 miles per hour bus out of your gut. It seems to lay there in your gut like a brick. But, if you cleanse your colon, that too shall “pass” from the system, and you can flush your cares away. For some people, they find that it helps them to lose a significant amount of weight. Some feel purging of the colon is an effective way to get rid of the toxins and will allow the energy that is in your intestines to focus itself somewhere else. It could help your energy level to be better. Everyone has a desire for that I am sure. Nutrition plays a critical role in mental health, and if you are weak at absorbing some nutrients, it could lead to losing your concentration. Vitamin B12 is famous for that in the senior generation. Being constipated once in a while can cause poor digestion. When your digestion is impaired, and you become constipated, all those wastes stay inside your body. If it is packed tightly in your colon, it can cause you not to be able to assimilate the nutrients from what you are eating, it can cause you to feel tired, and it will even lower your immune systems functioning. When you detox your colon, it gets that nasty undigested waste pushed on out of your body and gives your colon some ease and hopefully some regularity. The residue that lingers in your body is full of bacteria, and the purge gets rid of that so you can have proper nutrients being absorbed to support your health. Increase your intake of water, insoluble fiber, and soluble fiber can be a huge help in keeping your colon cleaned out in the future and may prevent issues with diverticulosis, and hopefully colorectal cancer. One thing that is always useful to use is for what is felt a total cleansing for some people is a “colon cleanser product in a supplement form” found in a capsule or powder made just for this purpose. It works quick, no cramping, and the colon is eradicated of all the toxins and bad bacteria that do not need to be clogging up your system. Your colon has a fresh start and the belly bloat is gone.